San Antonio Doula Service: Lullaby & Goodnight, Sleep Tips for Newborns. When my phone rings late at night it is usually a new mom who is very sleep deprived. The conversation starts out quite business like and quickly moves to tears as mom tells me that she hasn't slept for more than a couple of hours in at least a week. My heart really goes out to these exhausted moms as I used to be one of them. As a postpartum doula it is so great to be able to come in and help families get some rest and to show them how they can teach their new babies to sleep better and longer. I recently had a home visit with a mom whose baby was two days old. 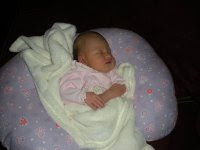 The baby had kept her up all night wanting to nurse every hour, but in the light of day was now sleeping like an angel. I asked when the last time baby had nursed and she started counting on her fingers and decided it had been almost four hours. I recommended that she start to keep a log of babies feeding times and feed the baby every 2-3 hrs during the day even if this meant waking him up for a feeding. I also don't think it is a good idea to feed the baby more frequently than every two hours as this can cause digestion and reflux issues for baby. I showed this new mom how to swaddle her baby up tightly and explained how to activate her babies calming reflex when he was fussy. We talked about how important it is to swaddle baby up and lay him down while he is still awake to allow him to learn to fall asleep on his own. This is a skill that even a newborn baby can begin to learn. We also talked about the fact that babies will sleep better and longer if they are swaddled, propped on a wedge at a 45 degree angle, and have a white noise CD playing while sleeping A week later mom called to say how much better things were going. The baby was stretching out to 4 hours of sleep at night and was eating and sleeping better overall. She said her family was amazed at how easy it was to calm the baby when he was fussy using the calming techniques she had learned. This true story is what makes being a postpartum doula so rewarding. Postpartum doulas offer wisdom as well as practical and emotional support to new families. Research has shown that the incidence of postpartum depresion is significantly reduced in moms that have the support of a postpartum doula. If you are a new mom and feel you need a helping hand with your newborn please seek out a postpartum doula in your area. She can help you and your family get the rest and support you need. If you live in the San Antonio area and need help with your new baby please don't hesitate to contact me. I am always happy to hear from you!